Text: Habakkuk 2:3 – ‘For the vision is yet for an appointed time, but at the end it shall speak, and not lie, though it tarry, wait for it, because it will surely come, it will not tarry’. The month of December 2018 has been declared a month of Timely Delivery by God Almighty through The Angel of His Church as inspired by the Holy Spirit. I have come to announce to someone here today, that God has not forgotten you or the promise He made to you, He says you should wait for it because it will surely come to pass in Jesus name. Brethren it does not take God one second to change your life and destiny for His Glory. The meaning of Timely: Something that is done or comes at a favourable or useful time. Ecclesiastes 3:11 says: He has made everything beautiful in His time. Brethren God loves us indeed and He is mindful of us and thinks and cares about our welfare. I would say what a time for this word to come to us because we are approaching the end of the year 2017 and He is reminding us that each of His promises over us He has not forgotten and He will deliver to us timely in Jesus mighty name. The Bible says in Proverbs 23:18 ‘surely there is an end to everything and the expectations of the righteous will not be cut off in Jesus name. Even the coming our Lord Jesus whom we celebrate today and always was timely: Galatians 4:4 ‘But when the fullness of the time was come, God sent forth his Son, made of a woman, made under the law. Brethren from my little walk with God, I have come to an understanding that God is never late, He is always on time, but if you do think He is late, it is because He wants to come bigger and I pray He comes like that for you in Jesus name. As led by the Spirit of the Lord we will be looking at the life of Hezekiah and the main accounts of Hezekiah’s reign are found in 2 Kings Chapters 18-20 Isaiah 36-39 and 2 Chronicles 29-32. Hezekiah came to the throne of Judah at the age of 25 years. He ruled with his whole heart by zealous enthusiasm for God, which spread to the people of Judah and throughout Israel. He showed great humility and wisdom and God caused him to prosper through tremendous blessings. Hezekiah became famous for many things, but I want to look at just one of the reasons why God blessed Hezekiah so abundantly. Ironically Hezekiah grew up under the rule of his wicked father Ahaz, so he didn’t exactly have a good role model to look to. King Ahaz faltered in every conceivable way against God, even sacrificing one of his sons to Molech through the fire (2 Kings 16:1-4). Perhaps Ahaz had no time or interest in his son and instead Hezekiah was influenced by his mother Abijah, the daughter of Zechariah. In an event, Hezekiah immediately changed everything once he assumed the throne and God gave him the power to do so. God gave him the Hebrew Prophet Isaiah to help him throughout his life. In the first month of his reign, Hezekiah immediately got to work and smashed down all the pagan altars and wooden images throughout the hills of Judah. He began to clean out and repair the temple and restored temple worship. In 2 Kings 18:5-7 we are told that Hezekiah trusted in the Lord God of Israel, so that after him was none like him among all the kings of Judah, nor who were before him. For he held fast to the Lord, he did not depart from following Him but kept His commandments, which the Lord had commanded. The Lord was with him, he prospered wherever he went. Despite the many accounts of others attempting to overthrow his rule, God blessed Hezekiah with success in conquering his enemies despite seemingly overwhelming odds. He conquered the Philistines and the relentless evil Sennacherib King of Assyria because he prayed to the God of Israel (The Only Living God/ The Man of War) God intervened by sending an angel to destroyed 185,000 Assyrians in one night. At some point after this Hezekiah became ill and was near death. Isaiah came to Hezekiah in the palace and told him that he must set his house in order, as he will shortly die. Upon hearing this proclamation Hezekiah turned his face to the wall and prayed to God and wept bitterly, asking nothing more than he is remembered for his loyalty to God. The answer of God in verse 5-6: Even before Isaiah left the building, God told him to return and tell Hezekiah that He had heard his prayers and seen his tears and He would heal him and add 15 years to his life. Isaiah returned and put figs on the boil of Hezekiah’s flesh and he was healed. God did even more than this for Hezekiah. He gave him a sign of his own choosing to know that he would be healed. Through the Prophet Isaiah, God offered Hezekiah a choice of whether he wanted the shadow on the sundial to move forward or backward by ten degrees. Hezekiah reasoned that moving time back would be more difficult, as time always moves forward. Imagine God turning back time for one of us if we asked Him to. The Greek woman did when she sought Jesus to heal her Daughter that was vexed of the devil, she was able to move the Hand of God to her favour and she received a Timely delivery. Some lessons we can learn from Hezekiah’s life and the timely delivery he always received from God. As soon as we understand God’s instruction to us, we must show obedience to God’s instructions & commands. If we want timely delivery then we must obey God on time. If we put it off for tomorrow that is not being obedient. (Example of King Saul) let’s be like Hezekiah, he went straightway in prayer with the letter from Sennacherib and again when he was told he was about to die. Deal with all things in a timely and humble way. Show God a humble, repentant attitude and heart. This is what pleases Him. Be like Hezekiah and King David, both of whom had passionate humility, deeply feeling sorrow for their inappropriate actions to the very core of their hearts. God’s mercy is always available to people with a sincere and fully repentant attitude. May God Almighty deliver all His promises to us timely in Jesus mighty name. May we never be late in life in Jesus mighty name. 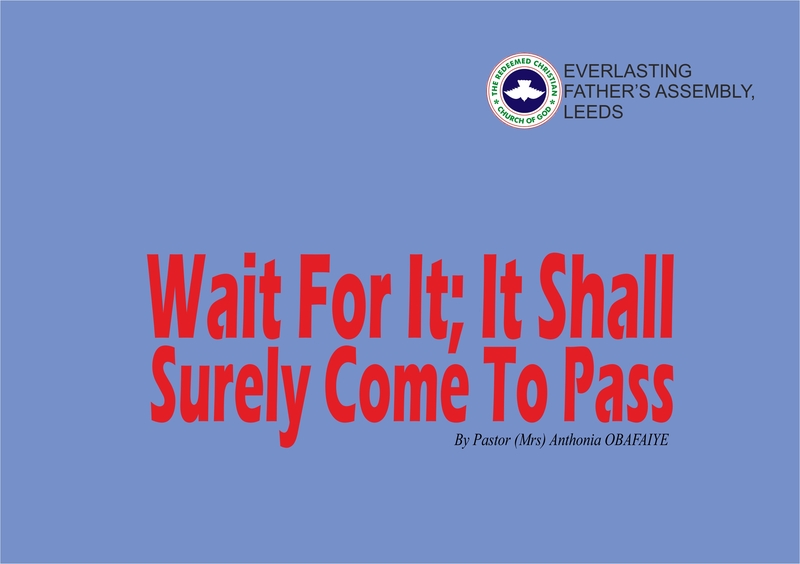 The sermon, Wait For It; It Shall Surely Come To Pass, by Pastor (Mrs) Anthonia Obafaiye, was delivered on December 24, 2017.